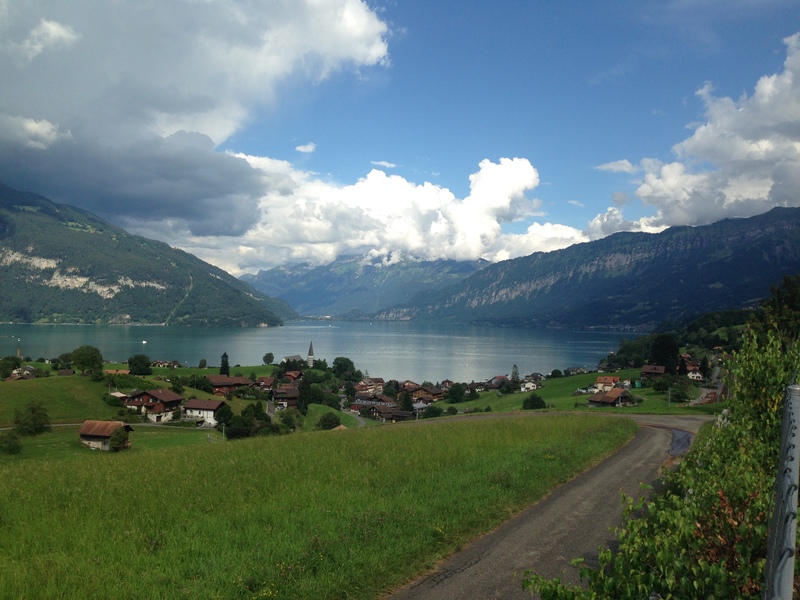 One thought that stuck with me throughout our entire stay in Switzerland was how clean the land was. I could have dropped a piece of pie on the ground and happily brushed it off on its way to my mouth. (not really but you get the idea) They take cleaning up after yourself to the level I wish my kids would go! Anyway. 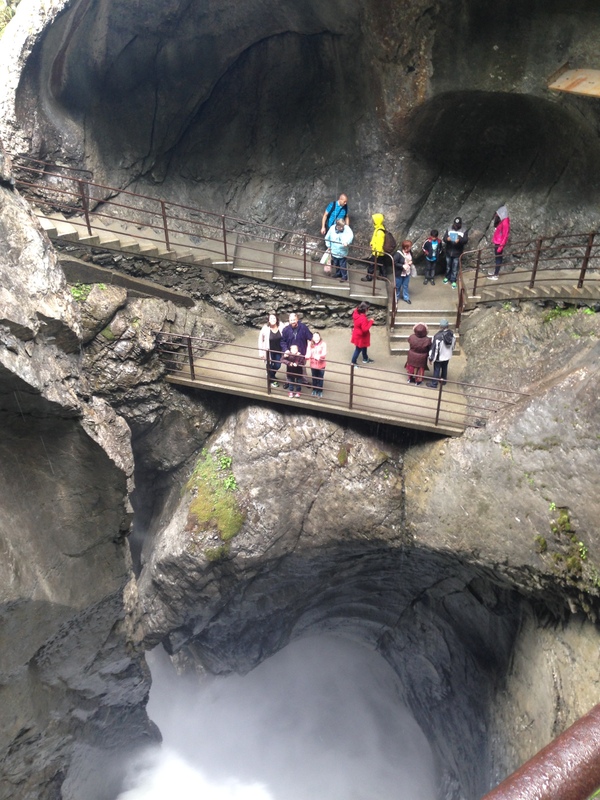 Our big trip was out to Trummelbach Falls in the Lauterbrunnen Valley. The pictures I have don’t do it justice so follow the link and check out the ones on tourism site. It is absolutely stunning. However, in order to get there, we had to cross a mountain. Well, let me rephrase that. 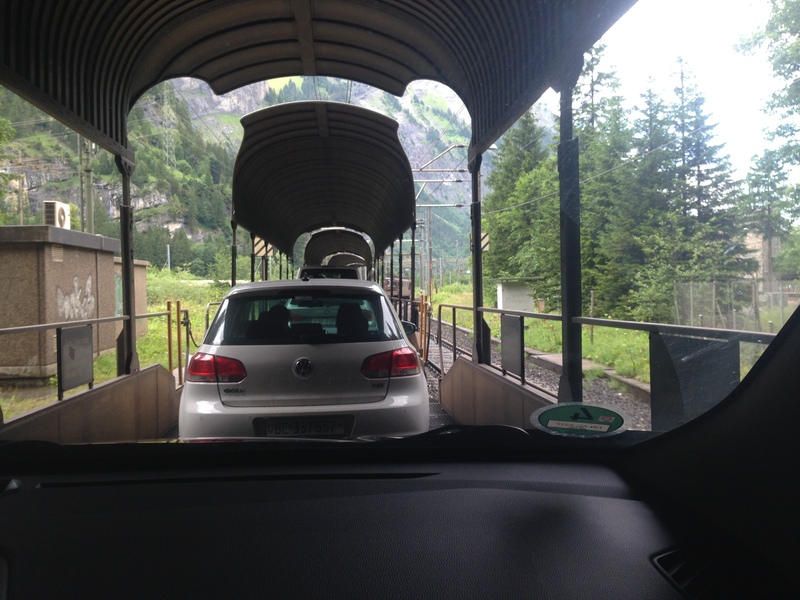 We had to go through a mountain….on a train…in our car 🙂 A car train! It was so cool! We drove on to the platform and the train scooted through the mountain. We didn’t even have to get out! 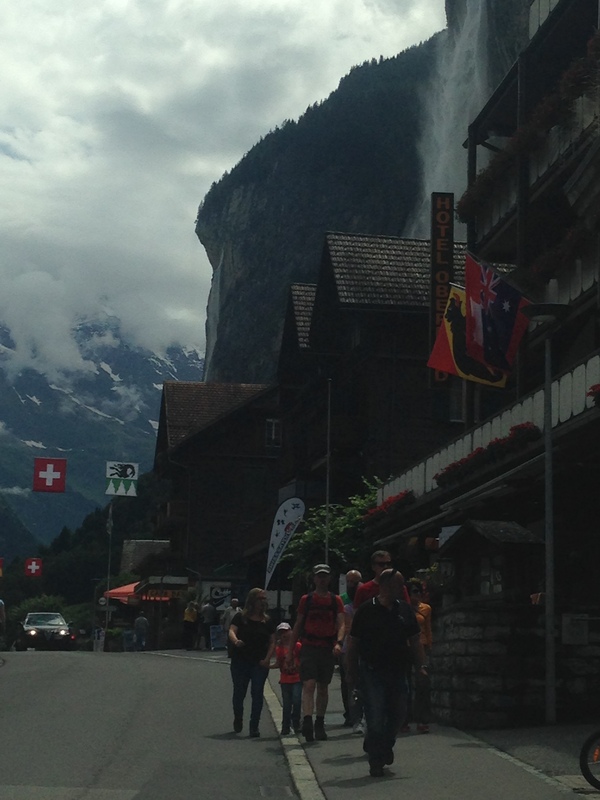 We arrived in Lauterbrunnen and were quite taken with the quaint Swiss town, but quickly made our way over to where the Falls were since that is what we were there to see. Now, you have to understand the enormity of this valley. You can hear it from miles away. The valley isn’t called the Valley of 72 Waterfalls for nothing! As soon as you enter the valley itself you can see waterfalls in every direction just gushing and roaring down the sides of the mountain. It is unreal. 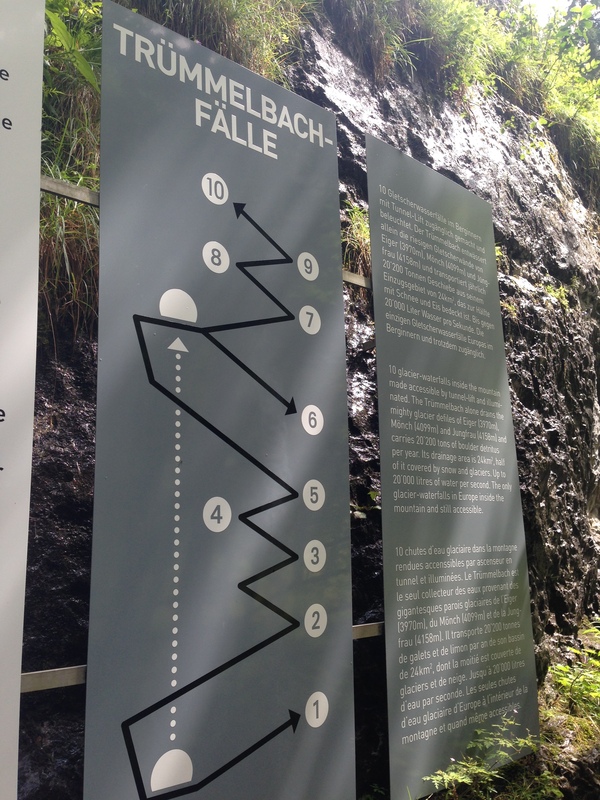 Trummelbach Falls itself is the only glacier waterfall in the world that is accessible by an underground lift, complete with tunnels and platforms. We decided to walk it! The low light, thundering noise, and spray from the 20,000 liters of water per second made taking pictures a bit difficult. The churning water pouring down the inside of the mountain literally took our breath away. We all ended up wet and exhilarated by the experience. Words cannot describe. The view from the top platform was also breathtaking. This entire day was amazing from beginning to end. The drive from our little mountain chalet was a bit long but so worth it. We even ended up picnicking out of the back of the car 🙂 And I made some locals honk at us as Carl stopped on the road to let me get this shot! I could have stayed forever! Previous Postwhat did we do in Switzerland?Next PostAhhhhh, Paris! 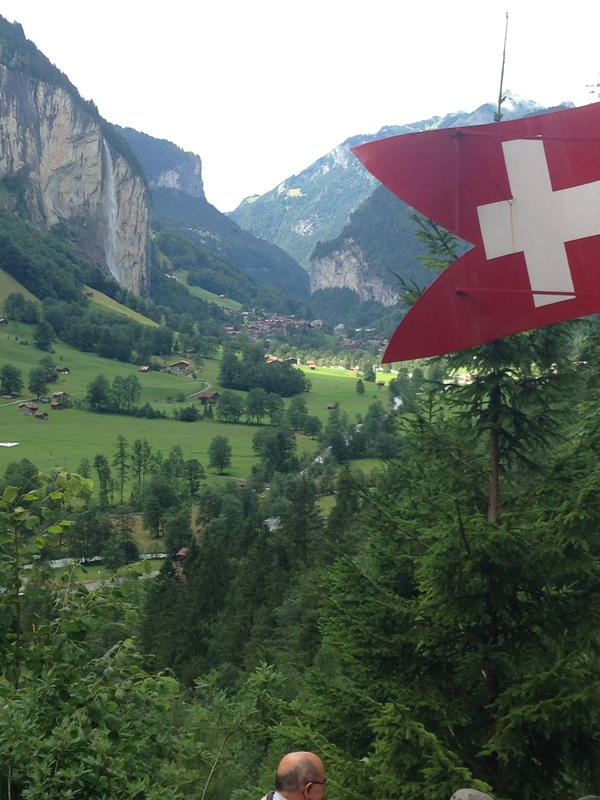 Switzerland sounds wonderful and looks beautiful! I’ve always wanted to visit. I’ve been to Norway before, which I think is kind of close to Switzerland, but it looks different. Anyway, your photos are gorgeous! Thanks! Switzerland is south of Germany, but once you’re in Europe those hopper flights are pretty cheap!